Globigerinoides ruber and Globigerinoides sacculifer (yup, that's a mouthful) are two types of planktic foraminifera (unicellular microplankton that float near the ocean surface) that are commonly used for paleoclimate reconstructions from deep-sea sediment cores. They live for about 2-4 weeks at the sea surface and create a shell in the process, which then falls to the sea floor after they die. Subsequently, the shells get covered with sediment that houses future generations of microplankton shells. Pesky paleoceanographers such as myself then retrieve sediment cores from the sea floor and try to reconstruct ancient climates by, amongst other means, analyzing various chemicals in the shells of the foraminifera (or "bugs" as we affectionately call them). One of the most important steps in producing a paleoclimate record using foraminifera is to identify and pick particular species of interest from a washed sediment sample. Planktic foraminifera live at the top of the water column, so their shells can be used to reconstruct water conditions (like temperature, salinity) at the sea surface. Shells of benthic species, which live at the bottom of the water column several thousands of meters below the sea-surface, can be used to reconstruct bottom water conditions. So, apart from identifying foraminifera from all the other microfossils under the microscope, distinguishing between planktic and benthic species is the first order step of picking forams. There are also many differences between different types of planktic (or benthic) species. For example, there are some planktic species that live or migrate through the thermocline as opposed to the mixed layer - both of which have their own particular physical properties; some species only grow in the winter whereas some bugs prefer to thrive in warmer waters. Further, different species have different metabolic pathways through which they process trace metals and stable isotopes from the seawater, which ultimately results in a different chemical signature in their shell. Therefore, unique species of foraminifera have unique applications in reconstructing various aspects of past climates. Unknowingly mixing different bugs can yield a chemical signal that has no accompanying physical basis. So rule number one: don't mix different species! 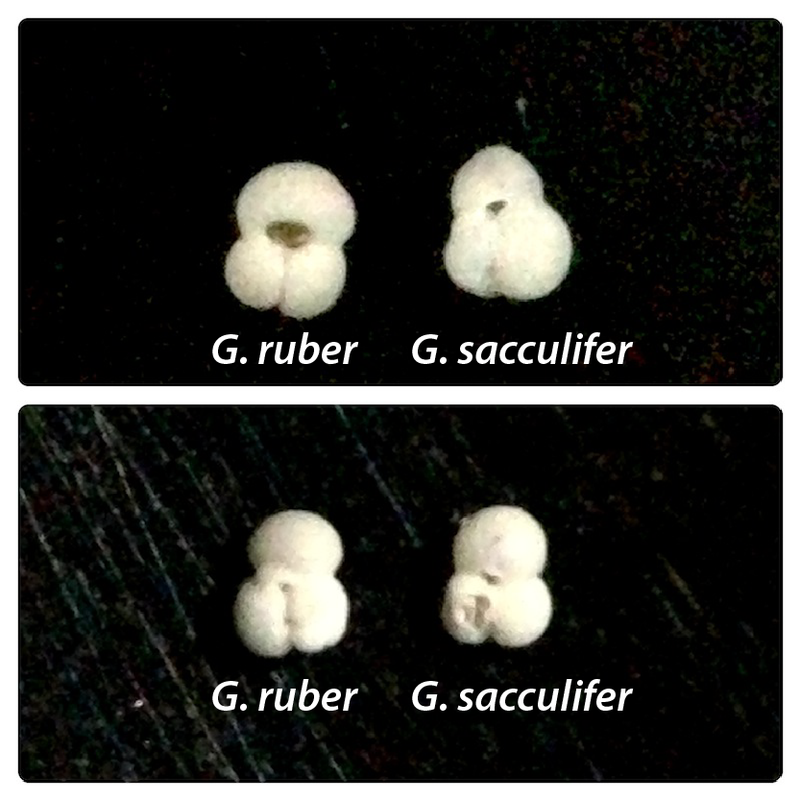 G. ruber and G. sacculifer (rubers and sacs for short) are both common planktic species found throughout most tropical and sub-tropical waters. Both of them dwell in the top ~50 m of the water column though the sacs appear to migrate to greater depths (e.g. here and here). Both species belong to the same genus, have an algal symiont, possess spines and both have shells that are trochospiral in nature. Specifically, the three chambered sac (aka Globigerinoides trilobus) is very similar to the white ruber - the four-chambered sac has a relatively giant sack as its fourth chamber. To the casual reader, suffice it to say that both of these bugs look very similar to an inexperienced eye. If you have any doubt at all when specifically picking either a ruber or a sac, zoom in and take a better look! An easy tell - look at the texture and structure of the bug: sacs have a characteristic honey-comb surface (the pores on the shell look like benzene molecules!) whereas rubers' honey comb structure is less pronounced and more lobey/smaller. If it isn't clear, changing the position of the light might help. To me, the sacs look much more sugary smooth than the rubers. The primary aperture (or central hole) of the sacs can vary from an oval to a split whereas the rubers' tend to be more rounded. Further, the rubers' primary aperture lies over its umblical suture, which may not necessarily be the case with the sacs. The suture on the spiral side of the rubers is more prominent than with the sacs. If your sediment sample contains pink rubers along with the white rubers, compare the bug in question with a pink ruber and see whether they're the same species! Of course, if all else fails and you are still in doubt - move on to the next bug! Don't pick a questionable bug for chemical analysis! The advanced bug-pickers - please feel free to provide tips of your own!